Phablets have suddenly become mainstream options these days. After the unexpected success of the Samsung Galaxy Note and subsequently the even greater success of the Samsung Galaxy Note II, really big smartphones or phablets, as they’re called are in vogue now. The only problem was that the only two options you had if you wanted a phablet were pretty expensive name branded phones or low quality, low priced local alternatives. Those days are gone though, with the release of 2 new midrange devices, the Samsung Galaxy Grand and Micromax Canvas A116 HD, good phablets have become more affordable. If you’re out to buy a large smartphone but don’t want to spend all that much, check out the comparison of the Samsung Galaxy Grand vs Micromax Canvas A116 HD so you can decide what device to buy! Bot the Galaxy Grand and Canvas A116 HD aren’t small phones by any measure and for now, we know only the Galaxy Grand’s dimensions and weight. It weighs in at 162 gm and is 5.65 x 3.03 x 0.38 in dimensions. We can assume that the Canvas isn’t going to be significantly smaller or larger than the Galaxy Grand and the main point of contention might be the weight. If Micromax manages to make it lighter than the Galaxy Grand, a lot of people might like it better. Screen wise, both phones come with 5 inch units, but the Canvas A116 HD has the definite edge here because it has a screen resolution of 1280 x 720 px (720P) while the Galaxy Grand comes with a rather disappointing 800 x 480 px resolution. Both are LCD screens with IPS but because of the higher pixel density on the Canvas A116 HD (294 ppi), we reckon everything will look better on it. The Samsung Galaxy Grand comes with an undisclosed SoC, most probably a Broadcom BCM28155, running a 1.2 GHz dual core processor, an ARM Cortex A9 with 1 GB of RAM, while the Canvas A116 HD comes with a MediaTek MT6589 SoC which has a quad core ARM Cortex A7 processor running at 1.2 GHz as well. There’s the same 1 GB of RAM onboard as well. The GPU is a PowerVR Series 5XT, which is quite decent. In terms of raw processing power, the Canvas A116 HD has the edge but if optimized well the Galaxy Grand won’t be any slouch in real world usage. Intensive apps, however, will probably run better on the Canvas A116 HD. Both phones come with a 8 MP rear facing camera, but if previous devices are anything to go by, the Galaxy Grand might have a better camera. This can’t be really confirmed unless we have actual comparison shots though. As far as front facing cameras are concerned, the Galaxy Grand one ups the Canvas A116 HD by including a 2 MP snapper compared to the latter’s 0.3 MP one. Storage wise the Galaxy Grand takes the cake as it has more internal storage at 8 GB and it supports expandable storage upto 64 GB. The Canvas A116 HD comes with 4 GB of inbuilt storage that can be expanded only upto 32 GB via MicroSD. All standard features like 3G, WiFi hotspot and MicroUSB v2.0 ports are included on both phones, but the Galaxy Grand comes with Bluetooth 4.0 compared to Bluetooth 3.0 on the Canvas A116 HD. Otherwise there isn’t much difference between the two. Also, both come with dual SIM support. One of the biggest differences is in the OS. 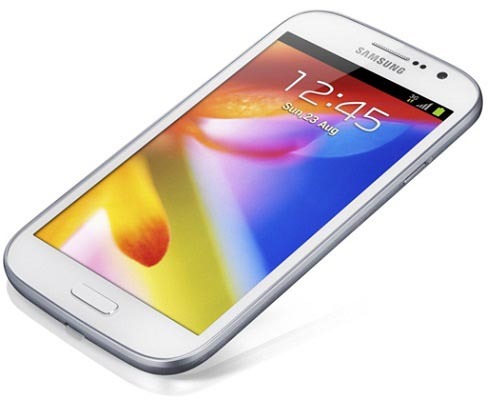 Even though both phones come with Android 4.1 Jelly Bean out of the box, the Galaxy Grand comes layered with the TouchWiz UI while the Canvas A116 HD is pretty close to stock Android. So it really boils down to what you want. If you’re a fan of close to vanilla Android, you might prefer the Canvas A116 HD. But the TouchWiz UI on the Galaxy Grand comes with a few extra features of its own like Direct Call, S Voice and a couple more. Again, it’s mostly personal preference. Micromax has promised an upgrade to Android 4.2 soon as well. Both the Galaxy Grand and Canvas A116 HD include large 2100 mAh batteries. Since both have quite different screens and internals, and haven’t been tested yet we can’t tell which has better battery life, but it’s likely that both will last the day since they’re not particularly power hungry. The factor that might tilt this comparison in the favor of one side is the price. The Galaxy Grand retails for Rs. 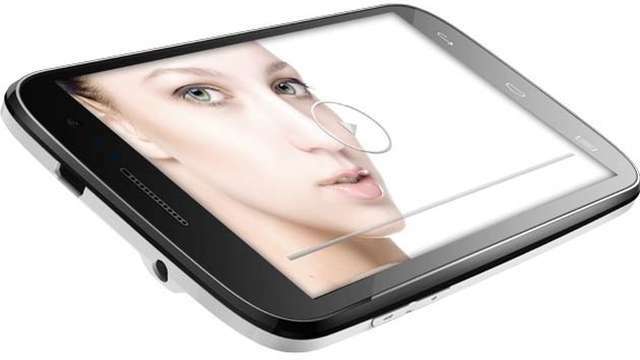 21,500 and the Canvas A116 HD will be available for just Rs. 15,000! It’s good to see the phablet niche heating up in India with both international and local manufacturers releasing powerful devices at a good price. We can’t really crown a winner in this comparison, but a lot seems to be going in favor of our very own desi Micromax Canvas A116 HD. If the Galaxy Grand sees a drop in price we can expect much better sales, because its main competition is priced quite a bit lower. 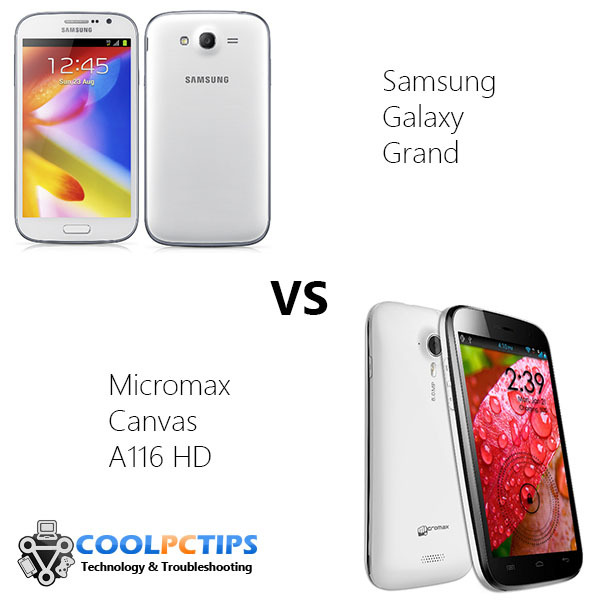 So what do you think of the Samsung Galaxy Grand vs Micromax Canvas A116 HD comparison? Which phone comes out on top? Let us know via the comments below!